An epic portrait of the Tiananmen Square protests, Ma Jian's Beijing Coma is one hell of a powerful novel. Ma closely surveys those costs from a distance. His books banned in China since 1987, he lived in self-imposed exile in Hong Kong for two years and has lived in London since 1997. His first book of fiction was Stick Out Your Tongue, set in a modern Tibet of lost illusion. Published in 1987, it is a brief chain of telegraphically arresting visions of life in the so-called Tibet Autonomous Region; traveling there had moved the author to an epiphany on the subject of just “how dehumanising extreme hardship can be.” Indeed, the experience of hunger is given exhaustive treatment. You get the sense of a people all but reduced to crawling on their knees because they lack the strength to walk. In one story, a young man sets out from the modernity of school to visit his nomadic family and dies along the way. He returns nonetheless, but now it is only half of him: “When he left Saga last month and boarded the bus to Mayoumu, he was so torn between the town and the grasslands that he felt as though his body were being ripped in two.” These are tales where the supernatural, the strange, is made natural. Ma writes a literature of return in which symbols of a nation left to hover between the past and the unsettled present become palpable. The book’s title refers to a manifestation of madness, specifically that of a girl whose mother was her grandmother, ill-used by men to the point of insanity. She would stick out her tongue in an apt greeting to a world that would permit such things. It also echoes the manner in which medicine–in this case, medicine all too strong–is administered. Thus, on its publication the book was banned as “a vulgar, obscene book that defames the image of our Tibetan compatriots.” In other words, it peered behind the placards of official doublespeak to lay bare some rough realities. Here Ma, who is often compared to Gogol (but who also shares a few licks with Hans Christian Andersen and Maxim Gorky), seems to say that to laugh or cry are the only possibilities when faced with the monumental hypocrisies of Communist dictatorship: “Do you know how many counter-revolutionaries they’ve had to execute in order to achieve the stable society we enjoy today?” one of the characters in Beijing Coma asks, to our snicker. But in most of this new work, in contrast to the previous one, his answer is: cry. Long, loudly and eloquently. For the murder of hope, in those who embodied it for one brief moment of 1989 in Tiananmen Square, and for every kind of loss there is. This is a hell of a powerful book. Through the recollections of Dai Wei, a protester who was shot in the head one fateful day in June and has lain comatose for ten years, the novel tells the story of a group of Peking University students–of fine arts and biology, of agriculture and education–who end up in the square. There, hundreds, perhaps thousands, of prodemocracy protesters were gunned down in the capital city’s great meeting place, “the symbolic heart of the Communist state.” This was the culmination of an occupation by the sons and daughters of those who lived through, or just as likely died in, the Cultural Revolution but had heard only whispers of its incomprehensible deprivations and brutalities; now they were to learn firsthand what some Chinese were willing to do to other Chinese. The seminal image of this fight for the Chinese people’s basic yet thoroughly denied “right to choose their own path in life” was the photograph of a lone man who had the guts, or whatever it was, to single-handedly stop a line of PLA tanks, and to likewise arrest the gaze of the world. In Ma’s stirring account, there were tens of thousands of these lone men and women gathered together, willing to sacrifice themselves, through self-starvation or even self-immolation, for the greater good. They had had that much of enough. Thanks in part to the ubiquitous reach of that image, we know exactly where this compendious story is going to end. Yet still there is considerable suspense. We are there, seeing through Dai Wei’s eyes; we hear the amplified speeches ring out into the massive space of the square, see the medical emergencies, feel the energy of the mass that has come together in hope of changing something big, though few are sure what exactly it is. And it’s from such uncertainty that Ma gathers the ironic fuel that propels this suspense: the students’ naïveté does not permit them to see where this is going, incredibly enough. As we stand with them, we take on the classic role of viewers in a darkened theater watching the hero descend into the basement of no return. Even more compelling, the narrative is driven by questions about Dai Wei and the nature of his memory; after all, he is a young man whose favorite book is a guide to the supernatural creatures of ancient China, The Book of Mountains and Seas. His paralysis gives him the not-so-Wordsworthian tranquillity in which to recollect his memories of the student uprising, as well as his poignant longings for the girlfriends of yesteryear. Thus his thoughts are allowed free visitation to the counterfactuals of the past and future, while his body remains imprisoned in a present of no possibilities. In this he is a metaphor for the thinker in China today. Beijing Coma is no simple document of an astonishing event in human history. Subtle and didactic at once, it manages to join these opposing qualities without a visible seam. Characters declaim on recent Chinese history, then comment on why there is need to do so, in lessons that manage to directly educate the reader and illuminate the fictional character. Here is some sort of literary magic. That we know the outcome is actually something we forget as we read, another neat trick perpetrated by an author who is both crafty and passionate: once we come to know these individuals, down to the smell of their shoes and the shape of their toes, the final stupendously crashing scene of pandemonium (as it echoes later in the solitude of poor Dai Wei’s thoughts) is as shocking as it could possibly be, short of our having been there. Pu Wenhua stumbled towards Bai Ling and tried to yank the megaphone from her. Too weak to fight back, Bai Ling sunk her teeth into his hand. Pu Wenhua was very frail too, so when Mou Sen gave him a light push, he fell flat on the ground. Mou Sen then slipped and tumbled on top of him, then Old Fu pounced on top of them both, and the three of them wrestled on the ground in a tangled heap. Ma is clearly frustrated by the ignorance of these young people, who he thinks should know more, if not better: “Was Hu Yaobang the President of China, or General Secretary of the Communist Party?” one character asks. Considering that the death of Hu, the reform-minded General Secretary of the party, triggered the entire catastrophe, this is no rhetorical question. Ma was both a witness and participant during the protests, which helps explain the panoramic force of his narrative. In a statement that accompanies the book’s publicity materials, Ma describes his extraliterary motivations for writing what amounts to an anatomy of human courage, as well as a cry of disbelief. 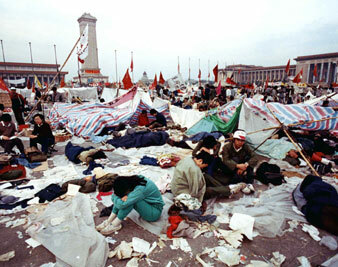 He spent six weeks camping out with the students in the square, at once thrilled by the sense that history was being made and dispirited by the knowledge that “in China political protests always end in a bloodbath.” He explains, too, the circumstances of his arrival at the device of the comatose narrator, a man who is helpless to do anything except remember, by which he would deliver his powerful message about the cost of a change that ends up not changing much. The fictional Dai Wei is inspired by his brother, also at this time in a coma after an accident. Therein hides one key to the novel’s secret strength, the quiet undercurrent of simple human emotion that flows beneath the mighty river of social history it also represents. Dai Wei lies alone with his thoughts, with his past, and fear and sadness color it all. He remembers saying goodbye to a lover: “I felt as though I’d just dropped a porcelain vase.” I can think of no more exquisite way to describe an indescribable loss. Where Stick Out Your Tongue is calligraphy, and The Noodle Maker a wink-wink version of some ironic pop poster, Beijing Coma is The Raft of the Medusa. It is a grand and sweeping and knock-’em-over epic. Dai Wei comes across as real and specific, and so are his friends in the square, who take on the roles of general, speaker, patriot, fighter and lover. They are hypocrites who are also heroes. As for Dai Wei’s mother, who doubles as his nurse, she provides some comic relief as well as the sense that life in China can be so desperate you would wish your own son dead; but barring that, you will sell his urine to those who would drink it as a health tonic and his kidney to anyone who will pay for it. As Dai Wei lies in his sickbed, he remembers. And that is what Ma Jian is really writing about: the act of remembering as the sole chance of hope for China. The world I used to live in has been transformed, like flour that has been baked into bread. I have to chew on it very slowly before I can recapture any sense of what it once was. In the wonderful translation by Flora Drew (the author’s wife and translator of his other works), the memories of a tremendous moment in the history of this vast, ungraspable place become grounded in a narrative that encompasses almost all that writing can offer. There is poetry: Dai Wei’s body is a map he follows to reach his past (“The soles of your feet exchange longing glances. The large mole on the small of your back yearns to speak”). The catalog of smells that runs through–sweaty tennis shoes, rotting cabbage, leaves, dank earth, garlic, dirty rags, “stale leftovers and oily pans”–is used like basting thread to tack the story down to knowable reality. There is the close observation of human nature and close scrutiny of the will to power. There is mordant wit, which is perhaps the only kind that ought to arise in the midst of tragedy: “Do you want me to give you the truth, or the lies that you’ve asked for before?” Dai Wei’s mother asks the police. There is the recounting of horrors that make you gasp (in the “re-education-through-labour” camps, depravity stops at nothing, not even the eating of remnants from excrement, or one’s fellow humans). There is, at last, the song of memory. Lest it become a dirge, Ma Jian says, the Chinese people must struggle to retain what they have lived through. Freedom to remember (for, today, the Tiananmen of only twenty years ago is in China officially forgotten) is the first freedom to guard. Even if they do, the author hints darkly in the voice of one of his characters, “We’ve now entered the era of chaos that precedes the end of the world.” It is all too easy to believe it. In any event, we will at least have had a fine bedtime story before the final sleep. My 8-year-old son asked the other day if, when one is cut, one’s blood evaporates. (He had been learning about the water cycle.) When I said yes, I suppose so, he replied, “Then there would be red rain.” And it occurred to me that only in China was there a possibility, in both senses, of a true red rain. Enough blood has been spilled by the Communist regime that it could actually have fallen to earth as precipitation. Among the flowers it would have watered is the great work of Ma Jian. Melissa Holbrook PiersonMelissa Holbrook Pierson is the author of three books, most recently The Place You Love Is Gone.